Mary Adelphine Patnaud was born on 17 December 1902 at Jersey City, Hudson County, New Jersey. She was the daughter of George J. Patnaud and Julia M. Coyne. Mary Adelphine Patnaud was christened on 4 January 1903 at St. John the Baptist, Jersey City, Hudson County, New Jersey. Mary Adelphine Patnaud married Herbert Thomas Stange, son of Christopher Stange and Elizabeth Dobbins, on 13 April 1925 at St. John the Baptist, Jersey City, Hudson County, New Jersey. 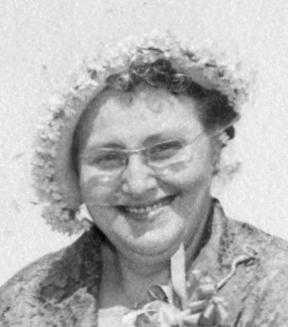 As of 13 April 1925,her married name was Mary Adelphine Mary A. Stange. Mary Adelphine Patnaud died on 21 February 1973 at Jersey City, Hudson County, New Jersey, at age 70. She was buried on 24 February 1973 at Holy Name Cemetery, 823 West Side Avenue, Jersey City, Hudson County, New Jersey.